The Board of Trade inspection of the extension of the Blackness Road tramway line took place on Tuesday by Major Pringle, R.E. This new section, which is about 1200 yards in length, continues the Blackness route from Balgay Lodge to Glamis Road, and has cost about £5000 to construct and equip. 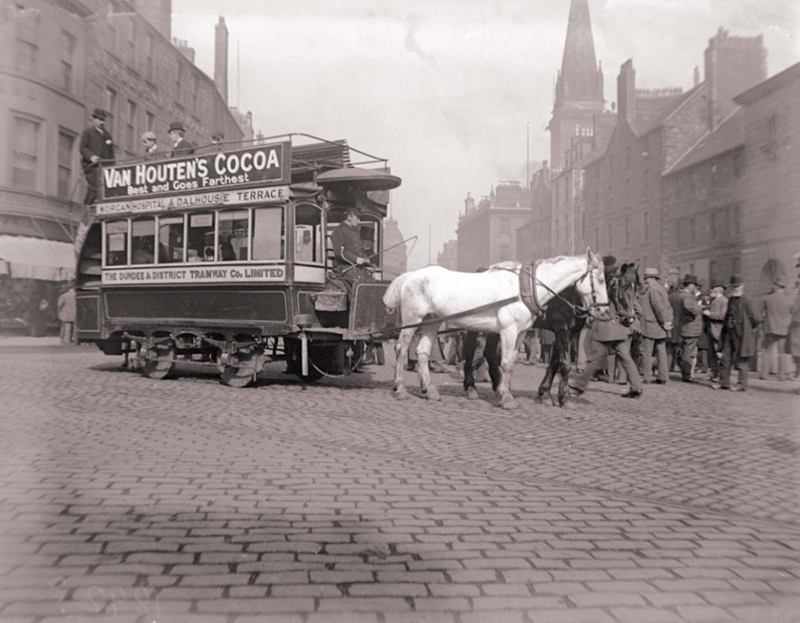 A number of members of the Town Council were present including Mr Johnston, the Convener of the Tramway Committee, together with Mr Fisher, the Manager, and Mr Thomson, the City Engineer. The company were taken over the line in a special car, and Major Pringle made a careful inspection of the permanent way and the overhead equipment. He was also much interested in the lifeguard of the car. 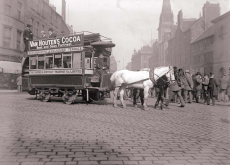 Major Pringle was next taken over the Princes Street route as the Tramway Committee are anxious to get some modification of the restrictions as to speed in view of the street improvements that have been carried out since the lines was constructed. It is also intended to double part of the line at Morgan Academy. Imagine your surprise, if you were toiling in a mill day after day and earning a very humble wage, on being suddenly told you had won £500! That was the position in which Mr P. Malcolm, a Dundee mill worker, found himself in when the “People’s Journal” representative called at his lodgings at 2 Dalhousie Terrace to inform him that he had been successful in carrying off the big prize for football skills in Competition No. 23. “Man! It’s Great! It’s a fortune. Fancy me winning a’ that money! I can hardly believe it, said Mr Malcolm, who is 43 years of age. He beamed with joy when he recovered from his first surprise. “I am a native of Glasgow,” said Mr Malcolm, “but I have wondered about a good deal. I came to Dundee when pretty young, and after that had a spell in England. Family ties – I lodge with my married sister- brought me back to Dundee, and although I am fairly happy and quite comfortable I have a hankering to be on the move again”. “What will I do with the £500? I only wish I knew”. “Frankly speaking, I have not yet made up my mind. I never dreamt of winning it, and so I never built up any hopes. But I am a strong temperance man, and you may be sure it won’t be wasted. I’ve already given you the hint that Dundee had a fancy for a new outside-left. The player is Weir, of Alloa Athletic, and formerly of Falkirk. Habitues of Dens Park may recollect his fine display for the “Bairns” in a certain league match there. Dundee were after two local junior forwards in Mahoney and Cavanagh, of the Violet, but the latter is started to have signed for the Hibs. It was understood that Cavanagh was going to Aberdeen; but presumably the terms offered had not suited him. Dundee Hibs have made a capture. Is Billy Hogg to be retained at Dens Park? That won’t be definitely known yet; but I hear the burly Englishman is just as likely as not to be wearing the Dundee colours next season. Billy has returned to favour, and the Directors are well aware that he is a very fine player. And all the branches transmit money by draft or cable to be paid over at any place in Canada, United States, South Africa, Australia &c, &c, on the most moderate terms. Branches: Dundee (6), Arbroath, Brechin, Broughty Ferry, Forfar, Glamis, Lochee, Monifieth, Montrose. Gilfillan Hall, To-day at 2 p.m.
A very large collection in all departments of literature as per catalogue, which is being prepared, will be sold in Dundee Auction Rooms, Ward Road, on Wednesday 1st April, at 6.30 p.m. On view on day of sale. Full particulars next Saturday. Robert Curr & Dewar, Auctioneers. Take a plate of cold potatoes, half the quantity of flour, one egg. Mix together to a stiff dough, roll out and cut into rounds, put a spoonful of cold minced meat, well seasoned on each round, turn over, press down the edges and brush over with egg. Fry in hot dripping for ten minutes. Mrs James Cruickshank, Cornhill. a new dress, costume, gown or hat. correct fashion decrees by the 16-window display. and view the excellent representation. Estimates for dress, costume, or hat given. The trouble amongst Dundee dock workers has not yet been settled. It may be remembered that last week they issued an ultimatum that unless a satisfactory arrangement was made by the Shipbrokers’ Association by Sunday they would refuse to work after ten o’clock at night. At present the men on a particular line work at 9d per hour up to six o’clock in the evening, after which they are paid at the rate of time and a half. They wish double time after ten. No answer having been received from the Association, the dockers are expected to give effect to the terms of their ultimatum on the first opportunity.